Every year, each alderman is allocated $1.3 million in aldermanic menu funds – yes, there is literally a menu to spend on infrastructure—that is, street and sidewalk repaving, curb replacement, bike lanes, street light replacement, and other capital projects. In most wards, this money is allocated by the alderman, with varying degrees of input from city departments, staff, and residents. Participatory Budgeting (PB) is a democratic process in which community members directly decide how to spend part of a public budget. The process was first developed in Brazil in 1989, and there are now over 1,500 participatory budgets around the world, mostly at the municipal level. The first PB process in the US was launched here in Chicago in 2009. Often, residents are very familiar with their neighborhoods and might have unconventional ideas that can improve their daily commute, parks, schools, and more. Participatory budgeting is a tool that taps into that resident genius and allows it an incubator space. 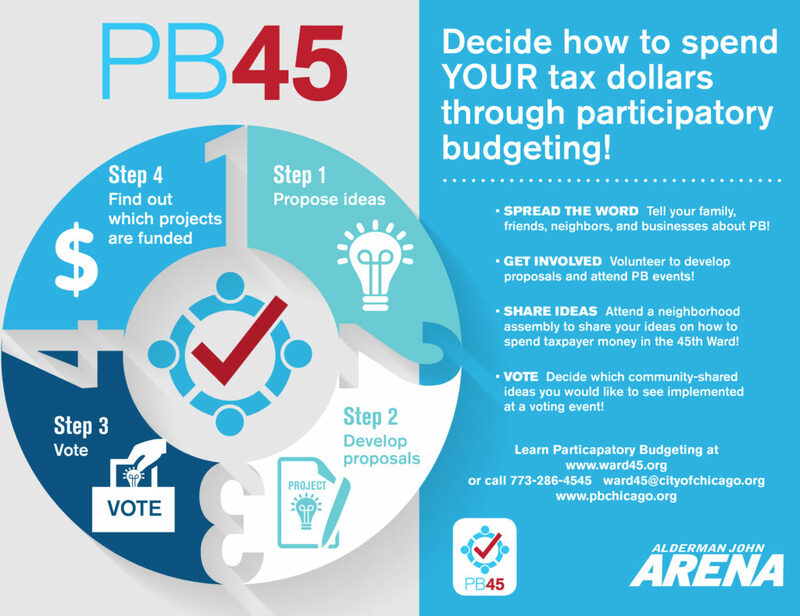 Since 2012, Alderman Arena’s office has given $1 million of its discretionary capital funds (“menu money”) to the community to decide how to spend through the participatory budgeting (PB) process. In the 45th Ward in Chicago, the process starts the spring before with idea collection via neighborhood assemblies, online submission, idea boxes located throughout the ward, and an idea wall in my office. This allows residents the opportunity to provide ideas on how they can improve their neighborhood. The projects suggested are sent to committees made up of volunteers. Throughout the spring and summer, those volunteers research the projects for feasibility and cost. They then develop the projects so they may be placed on the ballot. In the fall, the projects proposed for the ballot are presented to the community at project expos, explaining how those projects came about and answering questions from the community. May: PB begins! Ward residents and stakeholders propose ideas. May-September: Volunteer community representatives take those ideas and develop them into project proposals. September-October: 45th Ward residents learn about what projects will be on the ballot. October: Residents 14 years of age or older vote on projects, and the projects that receive the most votes are submitted by Alderman Arena for funding to the City of Chicago for implementation. This exciting process puts transparency into how the city spends our tax dollars and gives residents a real voice – by offering ideas and voting for specific projects – into how that money is spent in our ward. Who knows better what is needed in our ward than us? The mission of PB is to open up civic participation to people who have never before been involved. The goals of implementing PB in Chicago wards are equity, inclusion, community building, and to make government spending more effective.